Ava, 5, and her sister Aubrey, 2, put their hot pink Peltor earmuffs to good use. Josie attended her first Spokane Shock game a week after she was born. At 6 weeks old, she'd gone to multiple concerts. Now 21 months, she's gone to see monster trucks, the Harlem Globetrotters, outdoor concerts at Northern Quest and countless other Shock games. Each time, her tiny ears are covered by a pink pair of earmuffs designed to protect her hearing from the booming sound systems. She's the ninth baby in the family, so her mom and dad know how to balance parenting with living life. Her mother, Pamala Phelps, says the hearing protection isn't so different from putting your child in a car seat. "Having a little one doesn't mean staying home and missing events," she says. "It means take precautions to protect their little ears." A growing number of babies and children have been sporting ear protection at loud events; the market for children's earplugs and earmuffs has exploded in the past couple of years. Back in 1999 when Tom and Kathy Bergman opened Ear Plug Superstore, an Oklahoma-based purveyor of hearing protection products, there were no child-specific hearing protection products in the United States. Tom recalls that unless the sound actually hurt, as with firing a gun, no one was even thinking about it. "Demand today for child hearing protection is thousands of times greater than it was when we began in the business," he says. It all started with Apple, the daughter of Gwyneth Paltrow and Chris Martin, who was photographed wearing a pair of pink hearing protection earmuffs at a Coldplay concert in 2006. Ear Plug Superstore started selling the Peltor kids' version in the U.S., and for about two years they were the only company selling them. The kids' earmuffs became their most popular product by a factor of 10. Interest skyrocketed again in 2010 after 1-year-old Baylen, son of New Orleans Saints quarterback Drew Brees, sported a pair during the televised Super Bowl celebration. More recently, Jay-Z and Beyoncé's baby, Blue Ivy, has been spotted with a blue pair of Baby Banz earmuffs while taking a helicopter ride with her dad. Parents now have dozens of brands, colors and styles to choose from. EveryCasa, a brand of Spokane-based etailz, inc., carries Em's 4 Kids infant earmuffs in styles that range from camp to pink polka-dot. Pro Ears, maker of ReVO headphones for kids, reports that their most popular design is Skulls. Fashion statement aside, experts have welcomed the trend. The risk of loud noise in young ears is real — the American Academy of Audiology estimates that 12 percent of kids ages 6 to 9 have some noise-induced hearing loss. And the damage can't be reversed. A surprising number of family-friendly venues, from sports arenas to surround-sound movie theaters, are loud enough to pose a risk. Kami Fehlig, doctor of audiology at Spokane Ear, Nose & Throat, says parents shouldn't bring babies unprotected to racetracks and air shows where noise levels can be extreme. "It bothers me to no end to see these little ones out there with no hearing protection," she says. A lot of factors determine how much protection is enough, she says. Most products include a decibel rating that indicates what level of noise they protect against, but they won't be as effective if they don't fit properly. An extreme situation like an indoor shooting range requires double protection, with headphones layered over earplugs. Hearing loss can happen from one sudden sound, like a firecracker, or from gradual and repetitive exposure. Some people may like it loud, but an iPod at full volume or a stereo system with a thumping bass will cause damage over time. "A lot of these people don't have hearing loss yet, but they will," Fehlig says. Families with a tradition of loud recreation — shooting competitions, boating, truck pulls — have been ahead of the curve, often after witnessing older relatives deal with the effects of hearing loss. 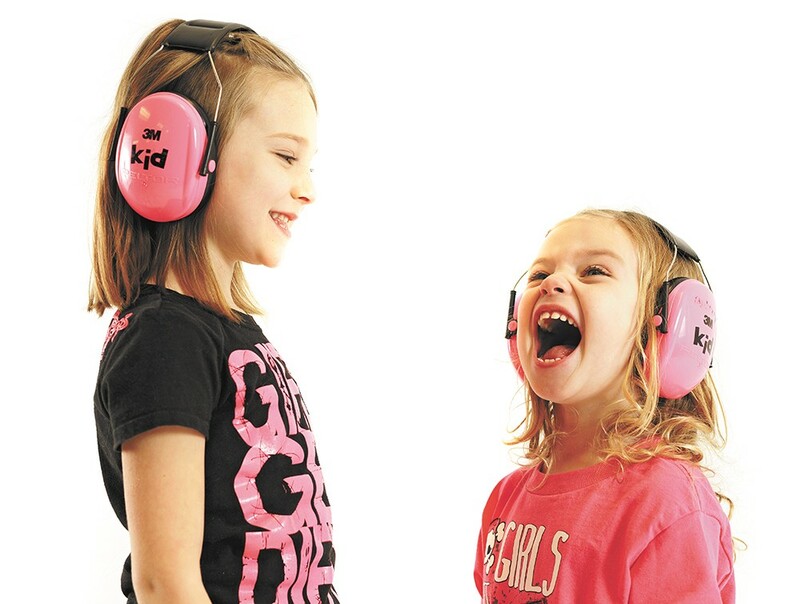 Jennifer Bocook grew up around motorsports, wearing ear protection, and her daughters, 5-year-old Ava and 2-year-old Aubrey, know that getting ready for an event means putting on their hot pink Peltor earmuffs. "I had them start wearing them from a very early age," she says. "They don't know any different." Of course, some kids just won't keep them on, no matter what. But other children end up wearing theirs a lot — their earmuffs empower them to control their own sound environment, even when the volume isn't loud enough to endanger their hearing. Benjamin Drake's two young children have worn ear protection at Dave Matthews concerts and even got to attend the Seahawks game in December when fans set the official Guinness World Record for loudest crowd (137.6 decibels). But his 3-year-old daughter, Frankie, likes to wear hers at other times, he says, like when they can hear fireworks from their home in Coeur d'Alene. "She always asks if she can wear them during the fireworks," he says. Tom Bergman of Ear Plug Superstore says they've seen increasing interest from educators who've found that earmuffs often help children with ADD, ADHD and autism-spectrum disorders concentrate and remain calm in the classroom. They got an order from one school superintendent who wanted to order enough pairs of earmuffs that every student could opt to wear them during test-taking sessions. Talk to them. A 2013 study by Dr. Deepa L. Sekhar, a pediatrician at Penn State College of Medicine, found that 70 percent of the parents surveyed had never talked to their teens about noise exposure. The study concluded that most parents were open to taking steps to prevent hearing loss, but underestimated the threat and assumed their child was not at risk. Use volume-limiting settings. Many devices, like iPods and phones, have settings that allow parents to set a maximum volume (and then lock down that setting). But keep in mind that different types of headphones can also affect how much sound reaches the eardrums. If you can hear it, it's too loud. Earbuds and headphones vary widely in quality, but a rule of thumb is that if any sound can be heard by someone nearby, it's time to turn the volume down. Avoid competing sounds. Volumes get loudest when sounds are competing with each other. Don't let kids drown out one loud sound with another loud sound — for example, no cranking up the music while mowing the lawn. Make hearing protection easy. Most kids aren't going to track down earplugs before they head out to the next concert or sporting event. But offer a pair on the way out the door, just in case, and they may very well decide to use them. For your teen musicians or frequent concertgoers, an inconspicuous pair of custom-fitted earplugs — the type professional musicians use — could be a worthwhile gift. For other resources, visit dangerousdecibels.org and turnittotheleft.com.